If somebody created sculpture gardens outside the undersea city of Rapture in the trashed genetic utopia game BioShock, these strange statues would be in it. 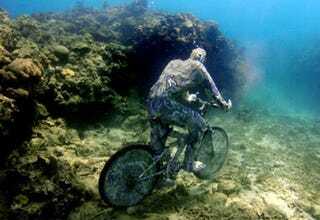 Jason deCaires Taylor is the curator and artist for what he calls the Underwater Sculpture Gallery in the West Indies. He populates the shallow waters offshore with haunting depictions of people doing ordinary things — like riding a bicycle. Gradually, each sculpture comes to life as it's covered in tiny sea creatures and plants. One of the most absurd and sad sculptures is of this man working at his desk. How many times have you sat down at your desk and felt like you were slowly sinking underwater? Probably the most gorgeous of Taylor's underwater sculptures is this one, of several people in a ring holding hands. Here is a detail of one of the ring people's faces, after many months below the waves. You can see a lot more of Jason deCaires Taylor's work in his gallery.